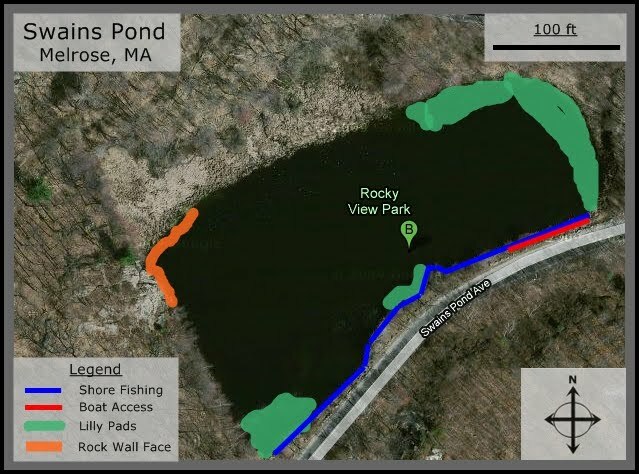 Swains Pond is a tiny little pond located in Melrose, MA. I fished it for about 3 hours and caught just over 10 bass. Nothing too impressive, but for the size of the pond, the fish were actually good size. It's located right near a couple other ponds as well in case you want to hop around that day. I fished almost exclusively on the eastern shore of the pond where the lilly pads were really thick but gave the fish perfect coverage from the summer sun. I did catch a few out in the middle, but your best odds are sticking to the shore. The southwest corner also produced some action for me as well. Although the pond is small, if you did want to put a boat in it, it wouldn't be such a bad idea. There is a steep rock wall on the northwest corner that gives the first some good structure to sit on. There are also some thick bushes on the northern shore giving the fish good coverage and giving you a perfect fishing spot. There's not much more to say about Swain Pond. Lots of fish, not too much water to cover, and parking right next to the pond. Good luck!